During the visit, the Cuban leader held talks with General Secretary of the Communist Party of Vietnam Central Committee and President Nguyen Phu Trong. Under the witness of the two leaders, Minister of Industry and Trade Tran Tuan Anh and Minister of Finance Dinh Tien Dung, representing the Vietnamese Government, and Vice President of the Cuban Council of Ministers Ricardo Cabrisas Ruiz, on behalf of the Cuban Government, signed a new trade agreement and a protocol on capital disbursement and financial management of cooperation in rice production development for 2019-2023. 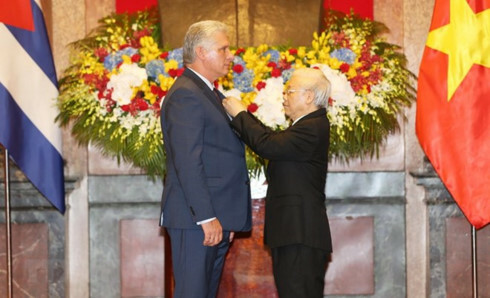 Party General Secretary and President Nguyen Phu Trong (R) bestows a Ho Chi Minh Order upon President of the Council of State and Council of Ministers of Cuba Miguel Mario Diaz-Canel Bermudez in recognition of his contributions to the Vietnam-Cuba friendship and cooperation. The Cuban leader also met with Prime Minister Nguyen Xuan Phuc, National Assembly Chairwoman Nguyen Thi Kim Ngan, and Secretary of the Party Committee of Ho Chi Minh City Nguyen Thien Nhan, as well as representatives of the Vietnam-Cuba Friendship Association. He also attended a Vietnam-Cuba business workshop. Earlier, the Cuban leader, his spouse and the Cuban delegation laid a wreath at the Monument of Heroic Martyrs and paid tribute to President Ho Chi Minh at his mausoleum in Hanoi. He also visited the Cu Chi Tunnels historical relic site and the Saigon Hi-Tech Park in Ho Chi Minh City. At the meetings, the two sides briefed each other on the situation in their respective countries and discussed orientations and measures to deepen the special relationship between the two nations in an effective and practical manner, while discussing a number of regional and international issues of mutual concern. The two sides applauded the growth of the bilateral comprehensive cooperation, including increasingly trustworthy political ties through the regular exchange of delegations and experiences. The two sides pledged to maintain close and all-round cooperation during their processes of national construction and development. They promised to make every effort to intensify and tighten their exemplary fraternity, traditional friendship, comprehensive cooperation, and faithful solidarity. The two sides discussed a wide range of measures to foster economic, trade, and investment partnerships in a result-oriented and practical manner. They also agreed to strength cooperative ties in defence, security, external relations, agriculture, biotechnology, pharmaceutical, healthcare, education, and science-technology, and people-to-people exchanges. They agreed to direct ministries and sectors to actively promote the implementation of the bilateral trade cooperation agreement, seek ways to facilitate businesses’ access to each other’s markets, and strive to raise trade to 500 million USD by 2022. On behalf of the Vietnamese State, Party General Secretary and President Nguyen Phu Trong bestowed a Ho Chi Minh Order upon the Cuban leader in recognition of his contributions to the Vietnam-Cuba friendship and cooperation.